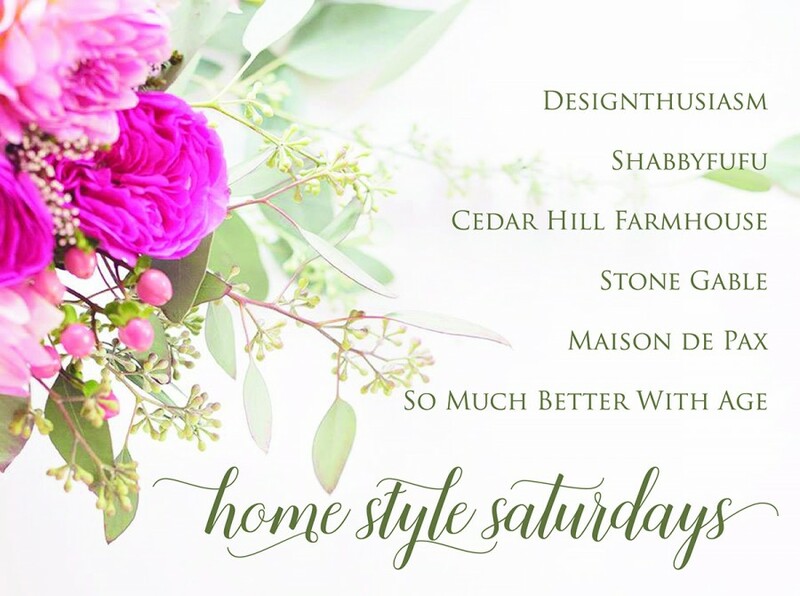 Today is Home Style Saturday. My blogging friend and I are pulling out our best archived post to give you another look. Please visit the posts at the bottom of the page! 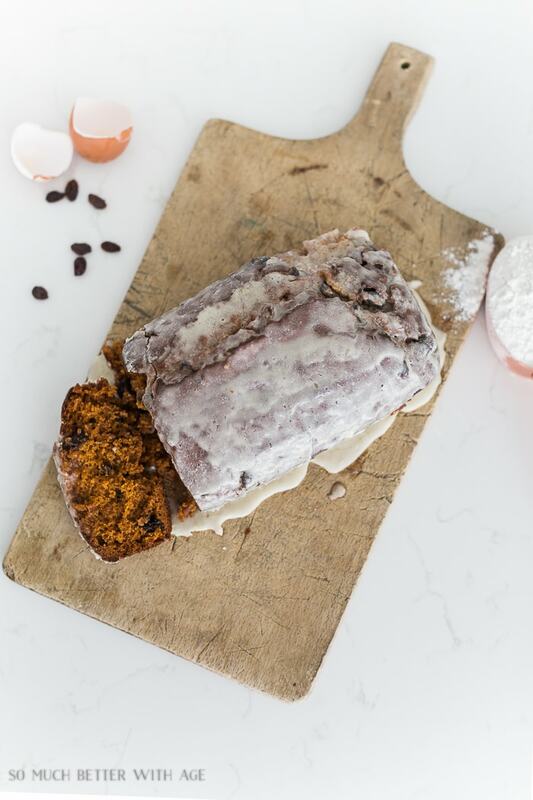 Hi Yvonne – I just love your blog! You have a beautiful home. I do have a question that I don’t think I’ve seen you address regarding pillows. 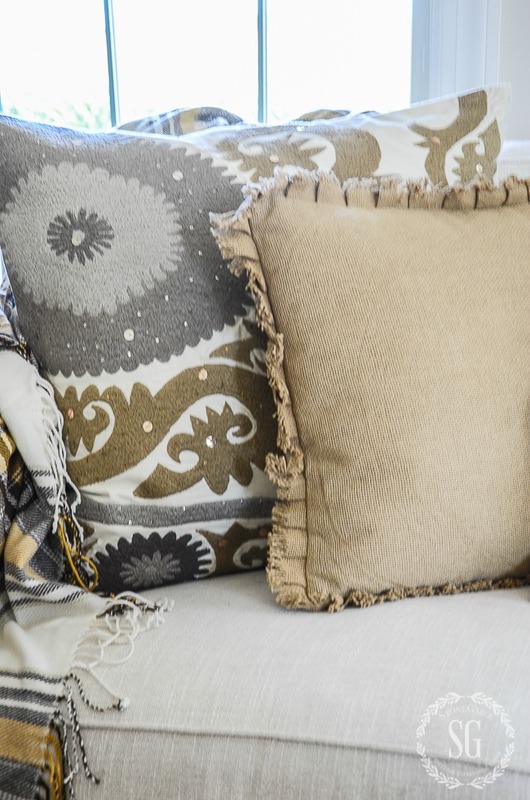 When you purchase throw pillows (and covers), what makes you decide to purchase just one versus a set of two? 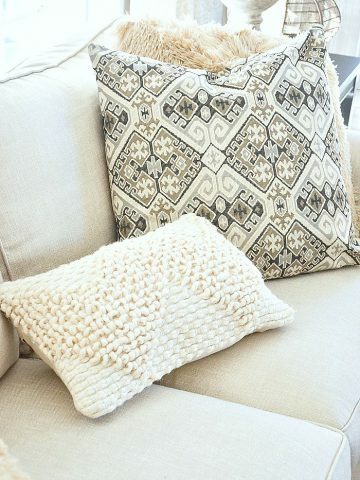 I thought maybe the more solid, neutral pillows you purchased a set, but then I noticed a few patterned pillows that you had in sets. I’m trying to decide on keeping a set of patterned pillows or just one as a “statement” on the sofa. Your answer is appreciated! What a great question! I’ll try to answer it in this post and offer a few rule-of-thumb tips too! 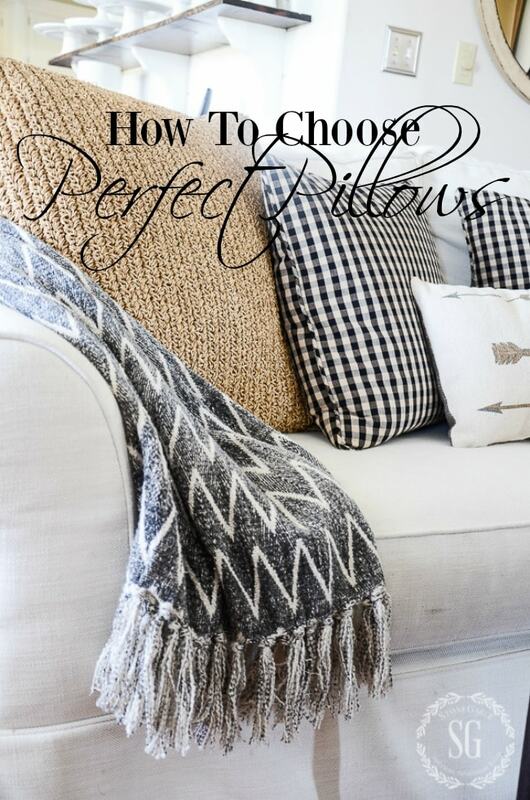 Let’s talk about choosing perfect pillows! I think it’s a smart idea to buy/make two pillows or pillow covers as a set if they are square. Especially if they are 18 inches or larger. 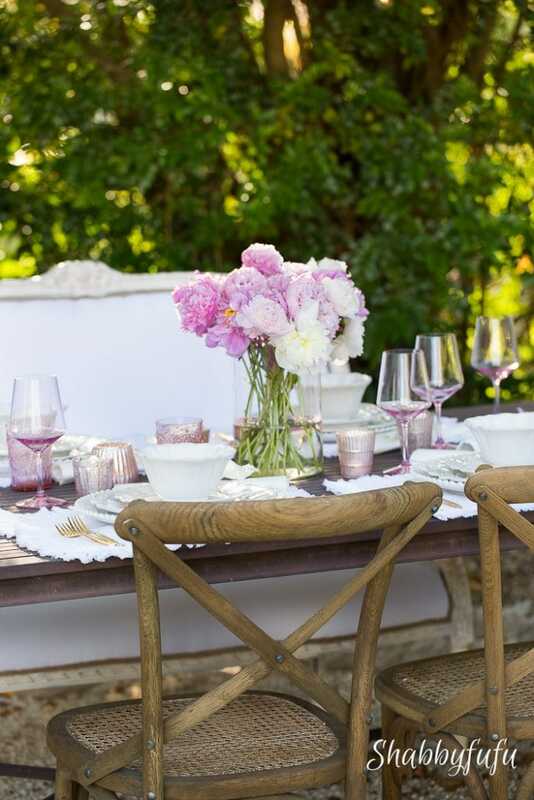 Even if they have a design or seasonal image motif they can be used on a pair of chairs, or used on either side of a sofa etc. 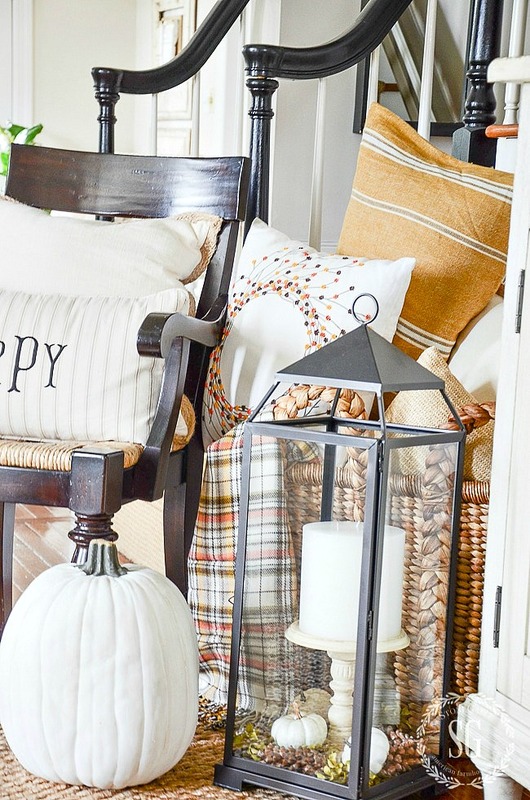 I bought one of these great pumpkin pillows from Pier 1 (SORRY, no longer in stock) and ordered another when I paired them with two black and white check pillows (see them HERE) in my dining room. Thank goodness they were still in stock at the time! And that’s another good reason to buy two like pillows. 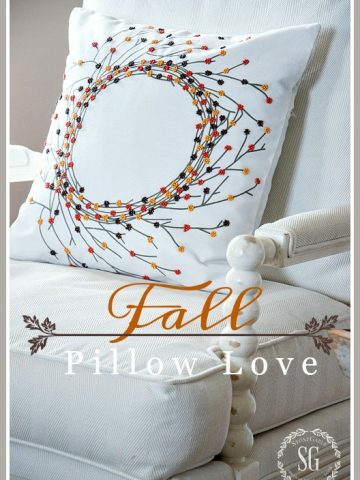 Most pillows come and go with the seasons or can sell out quickly. So, better safe than sorry if you really love the pillow! 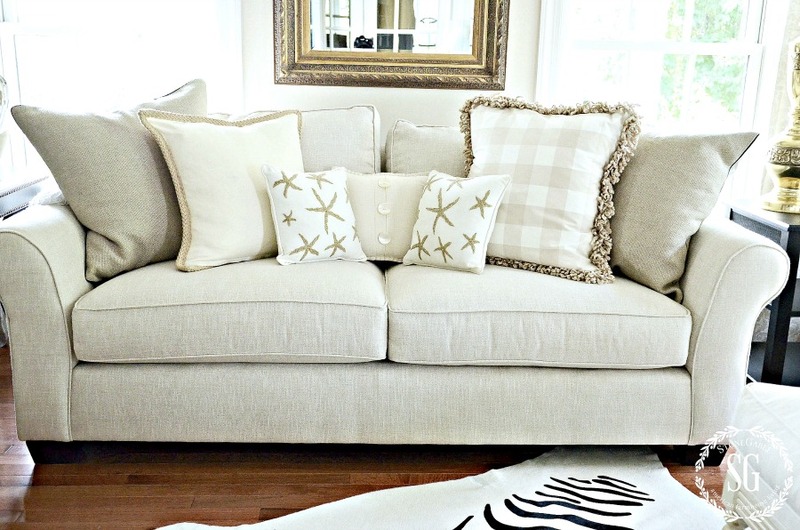 Even the small starfish pillows below can work together on a sofa or a bed. There are exceptions, but my general advice is to buy two pillows if they are squares! The exception is when I fall in love with a pillow and I can only find one. Then I take it home and use it on a chair or put it in the center of my sofa or bed. When it comes to a rectangular pillow, such as a lumbar, I buy one! They work in the center of a sofa, fit on a chair (depending on the size) and look great placed on a bed in front of other pillows. You can see this nubby lumbar pillow HERE. Rectangular pillows come in lots of sizes, just like square pillows! Round or uniquely shaped pillows usually work in pairs too! There are exceptions to these rules, of course. 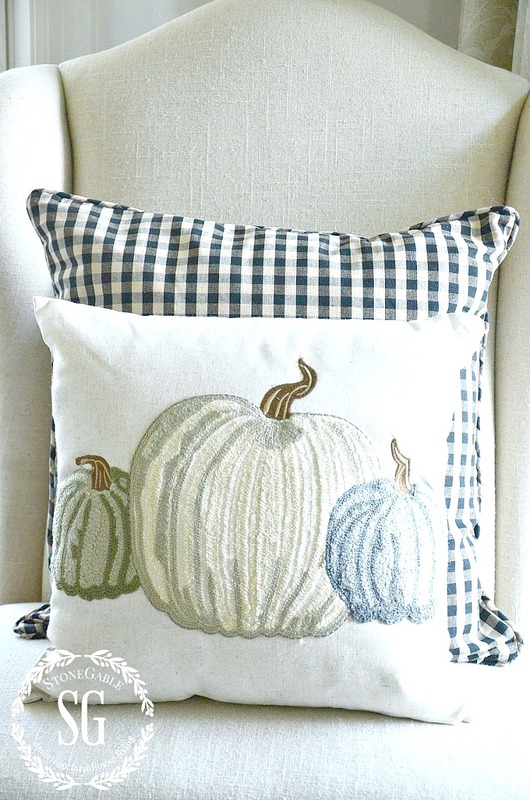 Remember to use your pillows to decorate your home and use in your baskets! They look great! 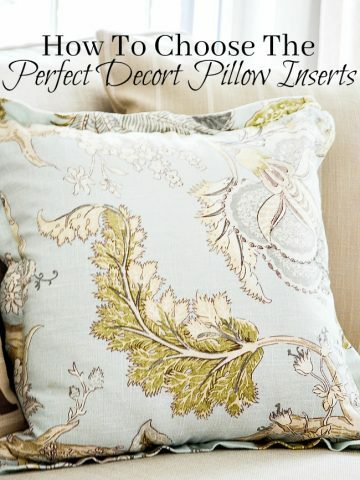 Choosing perfect pillows is all about common sense and sense of style! 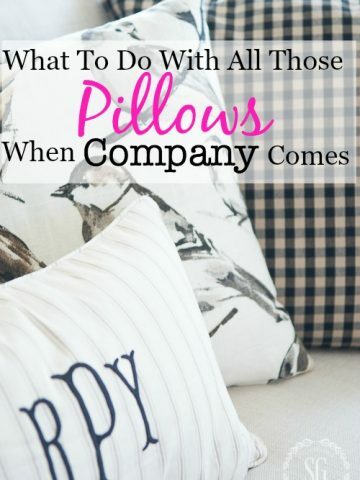 Here are a few other pillow posts to help you and for you to enjoy! 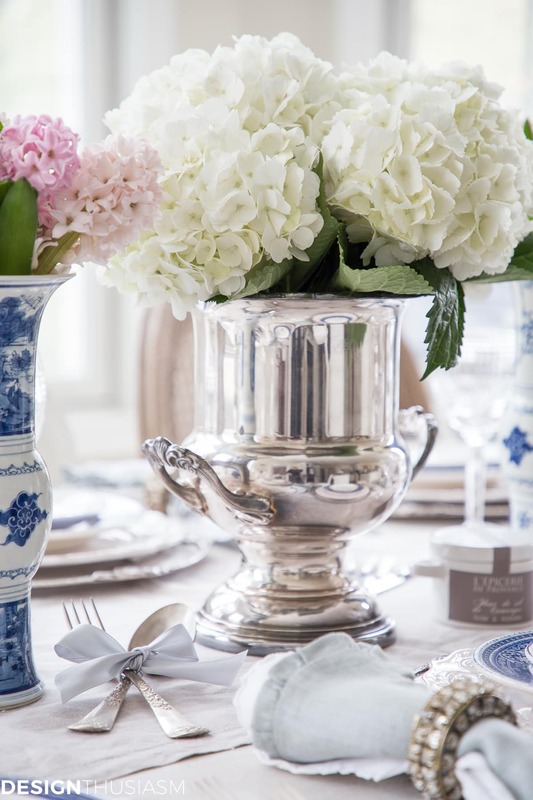 Follow me on Pinterest and see all the great things I’m finding to pin HERE. WHAT TO DO WITH ALL THOSE PILLOWS WHEN COMPANY COMES? Thanks for the great post. I’m in the market for new pillows for my sofa. I plan in just buying some fabric, but couldn’t decide where I was going with patterns or colors for spring. Should I get some spring colors or just stick to my colors for my living room? My sofa is cream so I pretty much can use any colors. 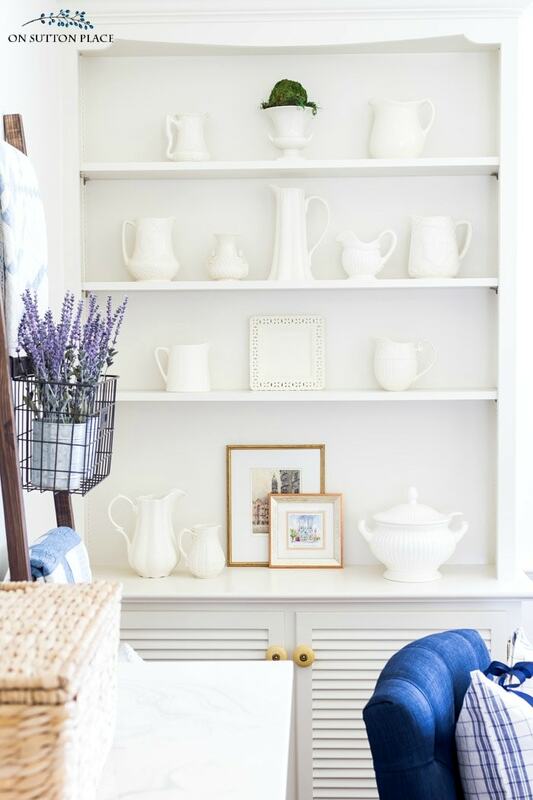 I think I will be sticking with neutrals for this spring and summer as I saw in your one photo. I like the way it looks and will go nicely from spring to summer. I love your pillow talk. ? I recently bought two mossy green pillows. They look wonderful on my sofa. BUT, what do I put on my loveseat? This part always confuses me. Do I have to match on both? 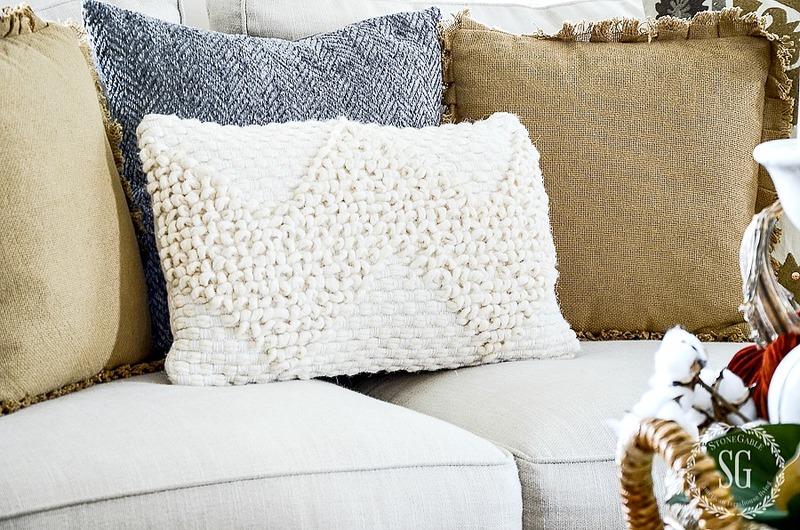 No, the pillow or pillows do not have to match. I would however pull some of that mossy green into the loveseat pillows. A print with that green in it or a buffalo check? 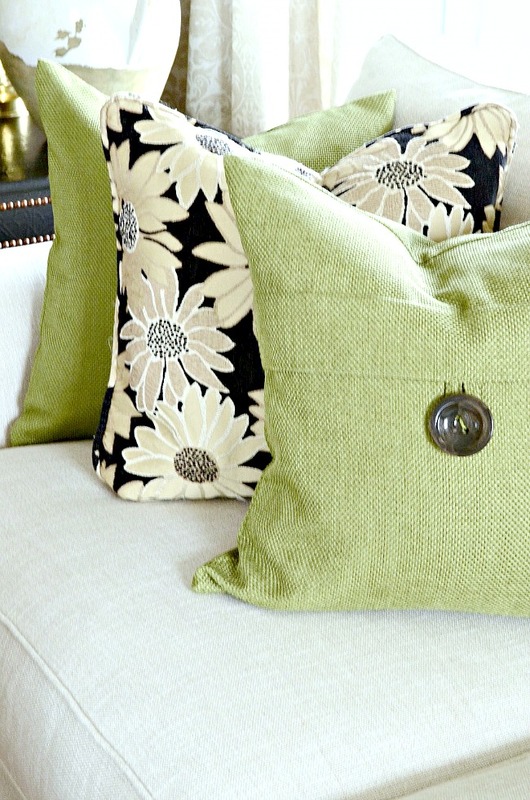 Just take one of the pillows with you if you shop for pillows in a brick and mortar store to get the green right. We are having a very winterlike spring here too! Come on warm weather! 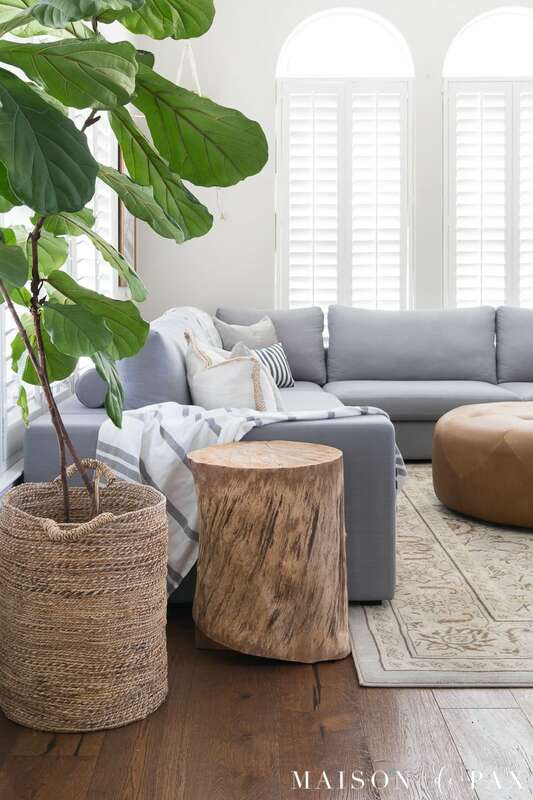 How do you handle styling pillows on side chairs in a family room? Obviously they need to compliment, etc. the pillows on the sofa but do the pillows in each chair need to match? I have two side chairs that face each other; one on either end of the coffee table in front of the sofa. 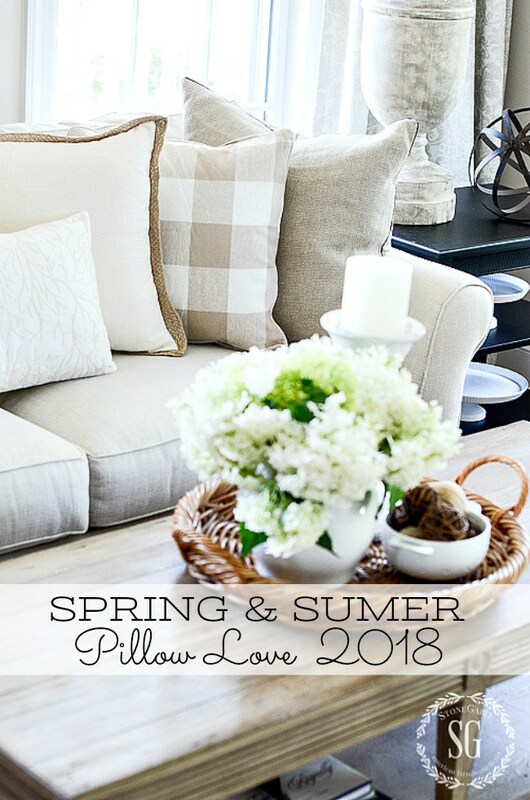 Thank you for the great tips on choosing pillows. Thanks for your tips on pillow selection! Sign me: Another Pillow Addict!!! I have two sofas that sit at right angles to each other. How do you style pillows for this situation? Do I match them perfectly or just have some pillows in common? 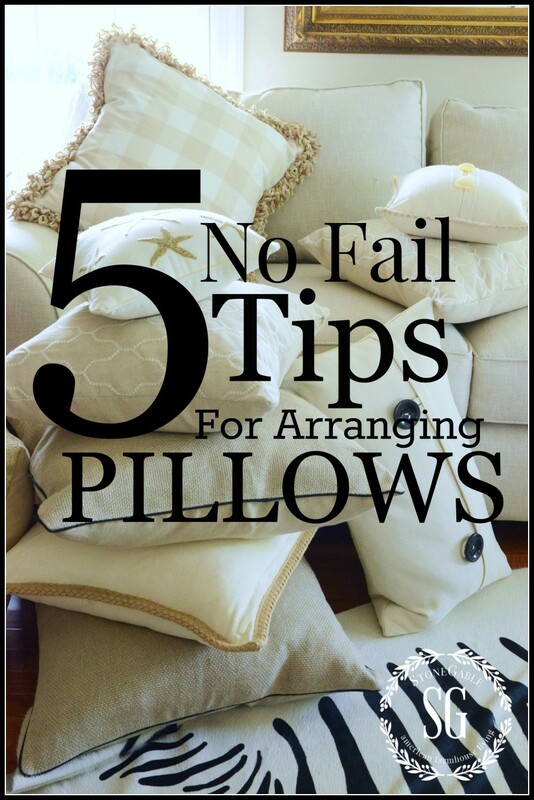 Good tips, love your pillow choices. I love it when you talk pillows!! Music to my ears!! Yvonne I’m new to your blog and just adore all your tips and advice. Thank you! Hi Tatum, Welcome to the StoneGable family! We are so glad you are here! You always have the greatest pillows . Time to look through my Christmas ones and add to my collection. 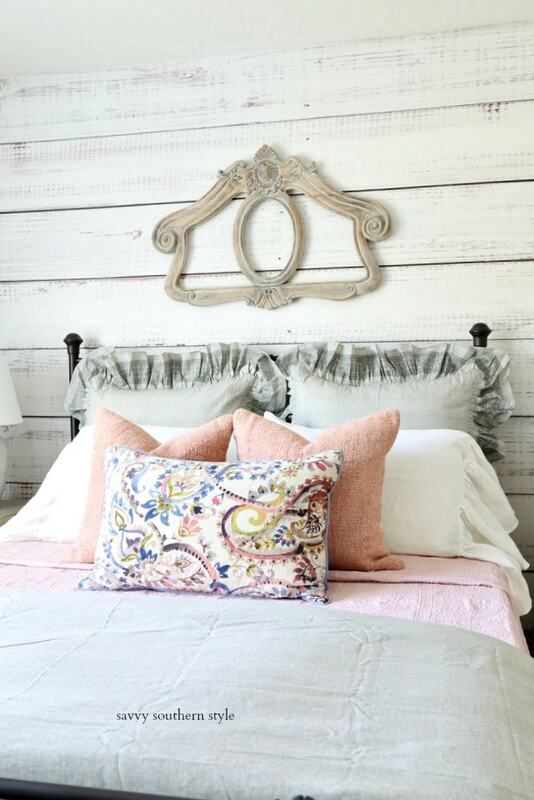 It is so fun to pursue the stores and on line for unique and colorful pillows.